Friday Night Lights: "The Lights Of Carroll Park"
"The Lights Of Carroll Park"
“As far as the Great White Hope coming in from the football field to save the day,” banger-turned-convict-turned-helpful-advisor Elden says this week, “those kids can’t see you as an outsider. They’ll smell that a mile away. You’ll do more harm than good.” He’s played by Larry Gilliard Jr., best known as D’Angelo from The Wire, where his character’s relationship with a character played by Michael B. Jordan—who plays Vince here—played a major role. (I’m trying to be vague for those who haven’t watched The Wire. Also, why haven’t you watched The Wire yet?) It’s been gratifying to see actors from The Wire turn up in other parts since that show went off the air, largely in worthwhile projects. (I’m not talking about Obsessed.) They carry some gravity from that great show wherever they go. And while I wouldn’t say that Friday Night Lights has the same journalistic grit as The Wire, the show has been extremely careful about the way it’s approached East Dillon, almost as if following Elden’s advice. True, it also seemed to invent East Dillon out of thin air this season, but it’s done right by it, not portraying it as the kind of place that Coach can fix just by going in and being the good man he is. It’s not that simple and FNL has portrayed its east side as home to a complicated collection of problems. But Coach has made a difference by the slow accumulation of small good deeds and a general commitment to East Dillon in general and the kids on his team in particular. He’s broken through Virgil's distrust—now not just a booster but a partner in crime-deterring—and by extension everyone else’s simply by refusing to go away. If he’d begun his tenure trying to organize something like the Carroll Park night game, he’d be run back to the west side. He’s part of the community now. That means taking pleasure in a victory like the Lions-meet-park-kids event but also knowing that Carroll Park will descend back into chaos if abandoned now, and that keeping it away from chaos will be a continuing struggle. No Great White Hope here, just a guy trying to push things in the right direction with a lot of help. 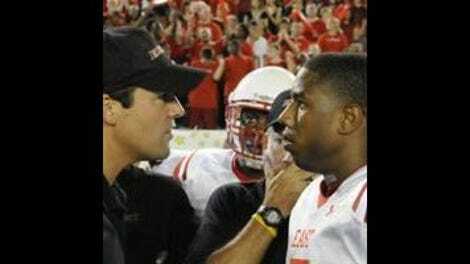 If Friday Night Lights were to present the game as solving East Dillon’s problems forever, it would be laughable. It’s one good night in the middle of a lot of bad ones. Elsewhere, the show dealt with the pleasures and consequences of kissing. Poor Glenn: His conscience has been troubling him for a while now so he decides to have an honest talk with Coach who has no idea what he’s talking about. My wife and I used to have an ongoing discussion as to which was the saddest character on television, Bill Dauterive from King Of The Hill or Artie Bucco from The Sopranos (especially in those later seasons). Maybe Glenn’s the latest member of that sad club. I love the way Coach quickly cycles through anger to a reasonable recognition that Glenn poses no threat to him or his marriage and then just starts messing with his wife’s would-be-lover’s head. “Oh, you’ll see me sooner than that,” are not words I’d want to hear from an angry Coach Taylor. I loved also how instantly the moment became a joke with between he and Tami. Coach knows her too well to let even an unwanted kiss she’s kept to herself—mostly because it mattered so little to her—stir any jealousy. Their morning “confrontation” is this week’s best scene. This week also sees Julie losing her post-Matt glumminess thanks to Habitat For Humanity’s Ryan, with whom she develops an instant, make-out-session-ready rapport. What a PSA for a good cause, no? Help out Habitat and you get to kiss cute boys. Will Habitat Ryan be back? He seems like a one-dose administration of medicine for melancholy—and too much like Matt without the complications—to be a steady Julie love interest, but who knows? There are probably more houses that need building. Chances are whatever transpired during their Habitat After Dark necking it won’t leave Julie pregnant, however, unlike Becky. I was dreading the Becky-gets-pregnant storyline when I saw it promoted in last week’s previews, but so far the show seems to be handling it well, presenting all the complications and mixed emotions of an unwanted pregnancy. Becky instantly knows she doesn’t want to be a mother but no doubt already entertains some of the mixed feelings Luke entertains before he even expresses them. It will be interesting to see where the show goes from here. The two highest profile recent depictions of unwanted pregnancy in recent years—Juno and Knocked Up—have taken a similar approach to abortion: Presenting it as an option its characters choose not to exercise then leaving audiences to debate whether that made them implicitly pro life movies. Of course, being movies about having babies, each had a practical reason for their characters to go through with the pregnancy: Without it, there’s no movie. That’s not true of Friday Night Lights, which has the chance to deal with the situation with all the accompanying thorns. It gets points just for taking it on, even more for handling it well, so far at least. • Good to see Gilliard and Jordan together again. Did anyone else unavoidably have the phrase, “Where’s the boy, String?” running through their head? • Joe McCoy stays in the picture. Makes sense that that marriage would go belly-up, but does it make sense that Mrs. McCoy would leave J.D. with her husband? Also, why was he so okay with detention keeping his son out of practice? • Buddy and the Mayor: That was some casual revelation. But it makes sense that the young Buddy would tear a path of broken hearts through Dillon in the 1960s, doesn’t it? I picture him leaner and with a George Jones-style buzzcut. Anyone else see him differently?